Dressmaker Julia Mahoney was at Evelina’s finishing up the barege dress that had taken so long to make. The traveling dress was put to one side, as Evelina was called upon to sew a shroud for a two-year old boy who had died just a few hours earlier. John T. Shepherd was the only child of a young shoemaker named John and his even younger wife, Elvira. The toddler was the first youngster that we hear of to die during the hot summer. Unfortunately, there would be others. Hannah Savage, right in the neighborhood, was ill with consumption and would never get better. 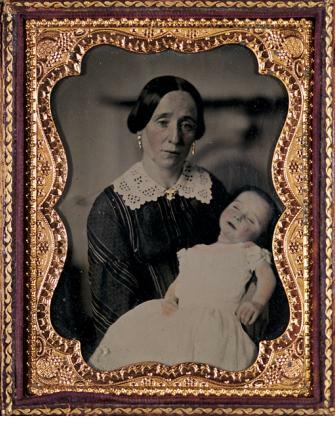 Her daughter Abby Savage “came after” Evelina to help keep vigil in the night, but Evelina didn’t feel up to the task. She felt well enough, however, to receive a call from her niece Rachel Gilmore Pool and to visit Edwin and Augusta Pool Gilmore across the street.